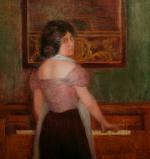 Art Nouveau genre scene in soft tones depicting a girl playing the piano was executed in 1903 in Paris by listed Czech-Jewish painter Adolf Wiesner (1871-1942). He studied under Vojcech Hynais in Prague and Prof. Setz in Munich. 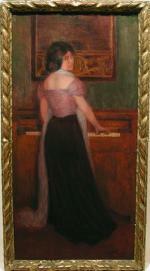 Works of A.Wiesner were exhibited in Prague, Vienna and St.Petersburg. In 1899 Baron Rotschild noticed young artist and granted him a stipendium to be able to study in Paris. Adolf Wiesner stayed there till 1911 were his paintings were exhibited at the Salon. In 1942 the artist was assacinated at "Terezin", Nazi concentration camp. Inscription: signed Ad.Wiesner, Paris, 1903, lower right. Measurements: unframed w 13" x h 25 1/2" (33 x 65 cm), framed w 14 1/4" x h 27" (36 x 68.5 cm).